Additional reporting by Abby Donlin. How does the Theatre Department do it? Every semester the designers and actors put on at least two shows, and the amount of effort on display can really blow you away. But you might be wondering how the show gets from script to stage. We interviewed the three designers of Albion College’s current production, Public Enemy, running the weekends of November 10 and November 17, to learn how they bring the playwright’s work to life. Here’s your viewer’s guide to the process of theatrical production. Before discussing the how, though, let’s talk about the what. Public Enemy is an 1882 play by Henrik Ibsen, a pioneer of “realism” in dramatic theatre. The story follows Dr. Thomas Stockman, who returns to his Norwegian hometown to find that the leather tannery is contaminating the water supply. He tries to make these findings public for the sake of safety, but faces obstruction from the mayor and business owners, who fear for the town’s economic well-being if the news gets out. “The starting point is reading the script,” said Kimberley Jones, a visiting assistant professor for Albion College and costume designer for the show. She explained that the designers read it two or three times before the design process begins, with each reading going deeper into the play’s meaning. The subsequent readings are “close readings.” This is when the design team reads the play two or three more times over the course of a few days to dig into the meat of the story: the subtext, themes and character motivations. They then draw upon this information to develop an artistic presentation of the play around a certain theme or motif. Finally, the director meets with the designers to pitch ideas and hash out their artistic angle. “We have decided to make it somewhat timeless in the sense that it covers the look, the costumes; you can’t really pick an exact time that the story takes place […]. It can be in any decade from the 1900’s to even the 2000’s,” said Jones. The design team thought that the play’s story about polluted water in a small town would be relevant to the crisis in Flint, Michigan, and other environmental disasters throughout history. Jones’ role in this “timeless” portrayal is to make the costumes run on a timeline from the late 1800’s to present day. Jones’ favorite design, for instance, is for the character Katrine Stockman, whose influence comes from 1980’s women’s business wear, with squared shoulders, a pencil skirt and a wool-tweed composition. Reference images were provided by Director Zach Fischer, and Jones started sketching. Jones begins her process before the cast is selected, sketching the character’s figure and clothes in pencil over the course of a few hours. Afterward, she uses colored pencils and a chalk overlay to design the color palette, which takes about an hour and a half. Once the cast is announced, she goes back to her sketches and modifies them slightly to the actor’s frame and body type. Having fit the character to the actor, it’s on to the shop to measure the actors for their costumes, fire up the sewing machine and get the actors fitted. If the actor’s body type isn’t right, Jones does a quick adjustment and tries again. Lather, rinse and repeat until each character has at least one costume. Now let’s not leave the stage undressed. 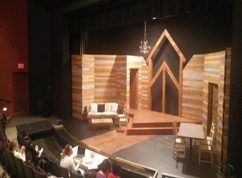 The set is a character, and its artist is Joel Klain, the college’s designated set and lighting designer. Like Jones, Klain starts with close readings, then moves on to research. He and Fischer collaborated on the stage design. “It was a Norwegian-inspired design [Fischer] was looking for,” Klain said. They focused on wood and stone, which have been fairly constant in Norwegian architecture, in order to emphasize the “timeless” angle. 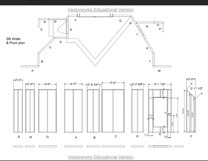 Afterward, he translates that diagram into a 3D model and presents it to Fischer for approval. Once adjustments are made, the plan is printed into what’s called a “working drawing,” and goes on to the shop for construction, where Klain works with the team over several weeks to bring his design to life. Then comes lighting, a process that can be even more complex at points. Designers select colors that not only make individual contributions to theme and setting but can also be combined to make other important colors. After researching how Norway looks in the early spring, Klain considered the color, angle and other “visual phenomena [like thunderstorms]” his light plot would need to portray. Klain decided on a warm amber, saturated blue. and lavender, with a cyclorama skydrop for extra visual interest. A cyclorama is a large curtain normally near the very back of the set that the crew can project lights onto to simulate times of day. Once the colors are selected, Klain decides where the lights will go on a lighting plot, which he then overlays on his stage diagrams. Finally, the crew divides the stage into “acting areas” and lights the stage area by area. 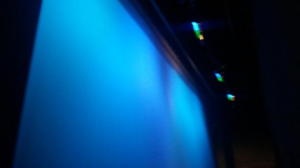 “We physically hang theatrical lighting to light the specific area in a specific way, and then we basically repeat that process until the entire stage is filled. It’s kind of an abstract process.” Klain said. You can see everyone’s hard work this weekend. Public Enemy will be showing at 8:00 P.M. Friday night, and at 2:00 and 8:00 P.M. Saturday. Once all is said and done, come back after the weekend to read our follow-up with director Zach Fischer. Photos courtesy of Zach Fisher, Kimberly Jones and Joel Klain.